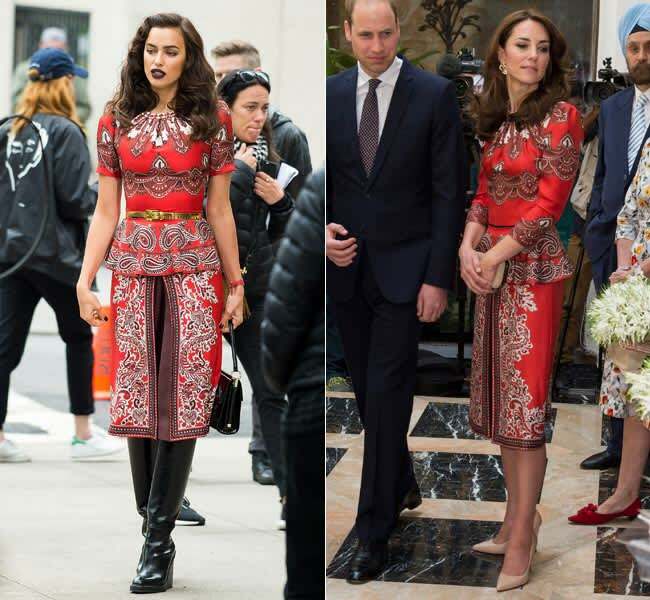 Irina Shayk channels Duchess Kate in exact Alexander McQueen dress | HELLO! April 29, 2016 - 14:40 BST hellomagazine.com The ladies looked equally stunning in the designer number! The very first dress the Duchess of Cambridge, née Kate Middleton, wore on her India tour – a beautiful Alexander McQueen number with a stunning print and peplum detailing – garnered worldwide praise. So it's no wonder Irina Shayk was spotted sporting the exact same dress as she did a photoshoot in New York. The Russian beauty looked amazing in the designer number, topping it off with black, knee-high boots and dark purple lipstick. Irina isn't the only celeb to have been inspired by Kate's style – after Kate was spotted wearing a Tory Burch maxi dress in Bhutan, just one day later Drew Barrymore sported the gown to an event in LA. The actress, however, had chosen to accessorise her dress differently. Drew kept things simple and teamed it with a pair of Christian Louboutin heels, while Kate oozed elegance by accessorising with sparkly gold earrings and a gorgeous orange shawl. But the Duchess also seems to be inspired by other celebrities... 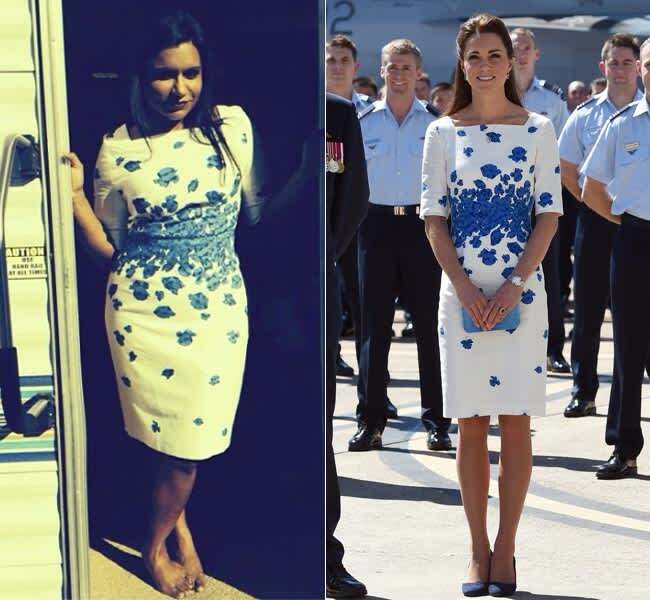 In 2014, Mindy Khaling was surprised to see Kate copying her style just one week later. After Mindy sported a chic poppy-patterned LK Bennett during a Mindy Project episode, Kate stepped out in Australia wearing the chic dress. After seeing the pictures of Kate, Mindy took to Instagram to share a side-by-side snap. "UHH, Miss Duchess Whoever, I WORE this dress last week!" she joked. "What's next? Kate in my donut print pajama bottoms I mean c'mon."